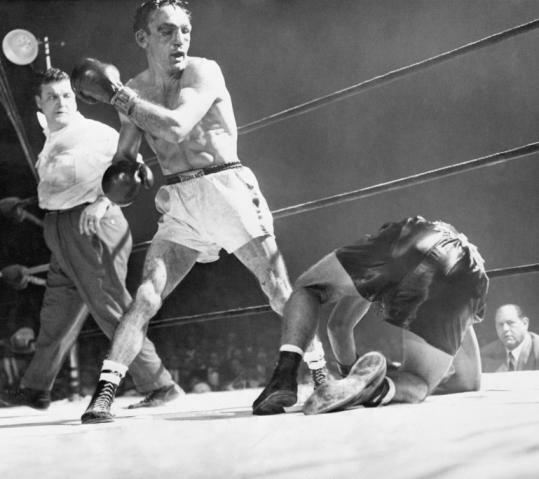 Though neither a pulverizing puncher nor a fast and fancy boxer, Carmen Basilio won both the welterweight and middleweight titles during an era that was flush with fistic talent. One of the most enthralling fighters of the late '40s and early '50s, Basilio once beat Sugar Ray Robinson, the man widely considered the greatest pugilist of modern times. In the ring, Basilio would wade through fusillades of blows delivered by fighting machines such as Kid Gavilan, Ike Williams, and Johnny Saxton. Like Marciano, he was a zealot in his conditioning and would wear more gifted opponents down with his enormous energy and tenacity. Angelo Dundee, his onetime trainer, told me, "There was no one with more determination than Carmen." Basilio was, in short, a Godzilla of the will. In his quest for boxing greatness, Basilio was not only up against highly elite fighters but organized crime as well. Though possessed by dreams of title belts, Basilio, unlike Jake LaMotta, steadfastly refused to cooperate with the mobsters who were the gatekeepers to the boxing kingdom. I had the honor of meeting the great champion two years ago at the International Boxing Hall of Fame that he helped establish in his hometown of Canastota, N.Y. Looking at the small but rough-hewn octogenarian, I could not help but wonder why no one had written a book about this remarkable character. No need to wonder any longer. In "The Onion Picker," Gary B. Youmans has told the tale of Basilio - at least up until March 1958, when Basilio lost his middleweight title in a rematch with Robinson, who at the time had an astonishing record of 140-6-2 and had never lost twice to anyone. The son of Italian immigrant onion farmers, Basilio was one of 10 children. The family was tight and so were their financial circumstances. While Mama Basilio loathed the fight game, Carmen's father was an ardent fan and encouraged his boys to study the sweet science. Although then, as now, pugilism was largely an urban sport, the Syracuse area was a hotbed of boxing. There was even a Canastota High School boxing team, of which Carmen was the star. When World War II broke out, Basilio signed on as a Marine. His boxing acumen was quickly recognized and Basilio never saw action. After the war, he took a job with the electric company and doggedly pursued his boxing ambitions at night - working out as much as three hours a day. As Youmans notes, the first quarter of Basilio's boxing career was unspectacular. He suffered serious hand injuries and during one stretch, lost five out of eight bouts. However, when he hooked up with local trainer John De John, Basilio began to master the whirlwind style that would make him one of the most popular fighters of his age. Indeed, as the author makes clear, for all of Basilio's caveman physicality, he was a supremely intelligent boxer who knew how to analyze his opponents and to adjust his tactics in the heat of battle. Youmans's descriptions of bouts, such as the legendary tussles with Boston hero Tony DeMarco, are enough to conjure vivid memories of the Gillette- sponsored "Friday Night Fights," on which Basilio would frequently appear. Thick with eye-catching photos, the book nails the brutish and criminal politics of the postwar fight game, yet it also reminds us of the immense popularity of the sport that today can barely command a column on the sports page. Basilio had an awkward style and like his subject, his biographer comes at his man from many angles. The transitions are not always as fluid as they might be and there are pages of plain block quotations culled from archived newspaper and magazine articles. Still, many of these quotes are ageless and in the end Youmans succeeds in pressing this very tough and yet noble man into the pages of our collective memory. A professor of philosophy at St. Olaf College, Gordon Marino is also a boxing writer and trainer in Northfield, Minn.